Architecture 2030 developed the Zero Tool for building sector professionals, 2030 Challenge and 2030 Commitment adopters, 2030 District Network Members, and policymakers. The Zero Tool is used to compare a building’s design or an existing building’s energy use intensity (EUI) with similar building types, understand how a building achieved its EUI (via energy efficiency, on-site renewable energy, and/or green power purchases), and set EUI targets. Until recently, ENERGY STAR’s Target Finder has been the primary program for determining a building’s site energy use intensity (EUI) baseline and design target. However, ENERGY STAR is planning to change their baseline from the 2003 Commercial Building Energy Consumption Survey (CBECS 2003) to CBECS 2012. The Zero Tool’s analysis is based on the CBECS 2003 dataset, an industry baseline which has been agreed upon by most building sector organizations including Architecture 2030, ASHRAE, AIA, and USGBC. The Zero Tool will allow those designing to the 2030 Challenge and other targets to maintain pre-existing baselines in order to continue to measure their progress. The Zero Tool also expands on Target Finder’s features, providing simple, clear, and graphic results for visualizing baselines, building design targets, and existing building performance. A Zero Score allows properties and building codes to be compared based on their relative ‘percent from zero’, allowing for normalized property and code comparisons across diverse locations, space use types, and building characteristics. For more information about Zero Scores, see below. Who Uses the Zero Tool? The Zero Tool is designed to be used by building sector professionals, 2030 Challenge and 2030 Commitment adopters, 2030 District Network Members, and policymakers. Explore examples of how the Zero Tool is currently used. Baselining more than one building? Check out the Zero Tool for Portfolios, a bulk upload and export feature that generates baselines for an entire portfolio of buildings in a few simple steps. A free and open-source Application Program Interface (API) for the Zero Tool software is available, enabling the software to be implemented as a website or an application for smart phones and tablets. To request access to the API, email info@architecture2030.org. What is a Zero Score? A Zero Score is a value assigned to a building, intended to help project teams understand the building’s energy performance and progress towards achieving Zero Net Carbon. A Zero Score is a relative performance metric, so it can be used to compare buildings across all locations, types, and sizes. The baseline, a Zero Score of 100, represents a typical modern building with an energy consumption profile based on data from the 2003 Commercial Building Energy Consumption Survey (CBECS) or the 2001 Residential Energy Consumption Survey (RECS) and normalized by climate, space type, building size, occupancy, and schedule. A Zero Score of zero represents a Zero Net Carbon building. All values in between are plotted linearly. 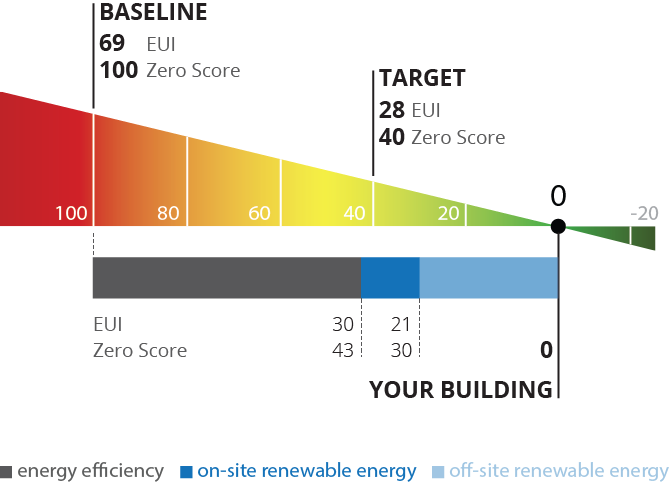 A building’s current or target Zero Score can be determined by dividing the building’s current or target energy use intensity (EUI) by its baseline EUI. The Zero Score calculation methodology is compatible with approaches used for the Zero Energy Performance Index (zEPI) and the Home Energy Rating System (HERS) Index. What is shown on the Zero Scale? The Zero Scale is intended to help project teams better understand the requirements of an energy reduction target and visualize their relative progress towards achieving Zero Net Carbon. The scale shows Zero Score values ranging from 100 to zero, with three markers related to the project: BASELINE, TARGET and YOUR BUILDING. The BASELINE marker lists the energy use intensity (EUI) and Zero Score for a typical modern building that is normalized by climate, space type, building size, occupancy, and schedule. The TARGET marker lists the EUI and Zero Score that the project team should attempt to achieve based on the target they entered into the Energy Reduction Target input box. TARGET values are calculated based on a linear scaling, or percent reduction, from the BASELINE values. The YOUR BUILDING marker lists the EUI and Zero Score for the building based on its actual energy consumption and generation. These values are calculated from inputs entered into the Annual Energy Purchased and Annual Energy Generated input boxes. Incremental EUIs and Zero Scores are also shown, indicating the building’s performance with no renewable energy generation, or with on- or off-site renewable energy generation only. If no values are entered, the YOUR BUILDING marker is not shown. Where do building codes fall on the Zero Scale? Use the interactive chart below to visualize where various building codes and energy reduction targets fall on the Zero Scale. The intent of the Zero Tool is to exactly replicate the underlying assumptions and methodologies and corresponding outputs of ENERGY STAR’S Target Finder, with the goal of preserving CBECS 2003 based, Target Finder derived energy consumption baselines (see the Zero Tool About Page for more details on the selection of the CBECS 2003 baseline). ENERGY STAR’S full set of Target Finder technical documentation reports can be found here. In a few cases, an exact replication of Target Finder was not possible or not desirable. Those instances are detailed below. ENERGY STAR reduced NOAA’s weather station list from 9794 to 778, in order to use only “stations with complete data going back to at least the year 2000”. * That list of 778 weather stations was not made public, nor were the assumptions guiding the definition of “complete data”, so the Zero Tool instead maps to the full set of 9794 weather stations. This methodology and list were also not made public, so the Zero Tool maps zip codes to the closest weather station. To estimate Site EUIs based on CBECS 2003 but normalized for location, building use type, and building use characteristics, Target Finder first calculates Source EUIs, then uses state- and use-type specific conversion factors to convert to Site EUIs. However, in the process of creating the Zero Tool we realized that for some states ENERGY STAR had inadvertently used the Source-to-Site conversion factor for “Other” space types instead of the conversion factor for “Multifamily” space type. For the Zero Tool we chose to instead use the Multifamily conversion factor for all states, which may result in discrepancies with Target Finder. Who created the Zero Tool? The Zero Tool was co-developed in 2016 by Architecture 2030 and Maalka. Maalka is an open-data platform that automates your building benchmarking program so that you can focus on engaging building owners, managers, and tenants to reach energy-use and carbon reduction goals. Working directly with cities across the United States, Maalka has developed award-winning applications that integrate data collection, validation, analysis, visualization, reporting, and outreach. A truly end-to-end workflow to help you maximize the impact of your energy benchmarking program. Maalka jumpstarts your benchmarking program by importing data from EPA Portfolio Manager .XLS export templates, EPA Portfolio Manager WebServices, custom CSV templates, and energy meters. Maalka automatically structures all your data and lets you manage access to it with a secure API. Maalka worked with cities across the United States to develop best practices for validating and cleaning data across building benchmarking programs. Use Maalka to set custom data validation rules and track the quality of data across your portfolio before taking next steps to analyze trends and visualize the data. Use Maalka to dynamically generate data-driven progress reports for each building in your portfolio using customizable templates created for the Department of Energy Better Buildings Challenge and the 2030 Challenge. Manage reporting and outreach campaigns with Maalka’s integration with MailChimp. To see more about how Maalka can help you manage your benchmarking and sustainability programs, visit www.maalka.com or contact the maalka team. Or visit our news page to learn about how Maalka is a DoE SEED App Showcase Winner, Department of Commerce Joint Venture Partner, and Wells Fargo IN2 Company. Architecture 2030 is a non-profit organization established in response to the climate change crisis by architect Edward Mazria in 2002. Architecture 2030’s mission is to rapidly transform the global built environment from the major contributor of greenhouse gas (GHG) emissions to a central part of the solution to the climate crisis. to advance the regional development of just and sustainable, resilient, carbon-neutral built environments that can manage the impacts of climate change, protect and enhance natural resources and wildlife habitats, provide clean air and water, generate local low-cost renewable energy, and advance more livable buildings and communities. Architecture 2030 issued the 2030 Challenge to chart a path for the building sector towards every new building and major renovation being carbon-neutral by 2030. Today, the 2030 Challenge has been adopted and is being implemented by 70 percent of the top 20 architecture/engineering/planning firms in the U.S. and Architecture 2030 programs and initiatives are helping the built environment move towards zero carbon by 2050. To learn more, visit architecture2030.org, or follow Architecture 2030 on Twitter and Facebook. The Zero Tool – an Architecture 2030 project – was developed for building sector professionals to establish energy reduction baselines and targets, compare a building’s energy performance with similar buildings and to codes, and understand how a building achieved its current energy performance. Architecture 2030, in offering the Zero Tool, accepts no responsibility or liability for the accuracy of the baseline and target data estimated by the Zero Tool, or for the design of buildings utilizing Zero Tool baselines and targets. The underlying assumptions and methodologies of the Zero Tool are based on those developed by EPA’s ENERGY STAR program, and are intended to serve as guidelines when setting performance targets and understanding (relative) building performance.